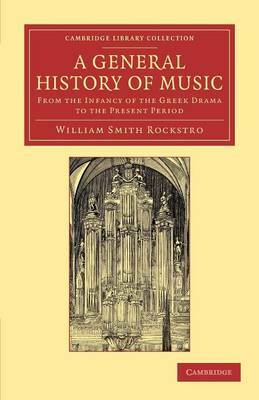 A friend and pupil of Mendelssohn, the composer and author William Smith Rockstro (1823-95) was regarded as an expert on early music. He contributed articles on the subject to Sir George Grove's Dictionary of Music and Musicians as well as teaching counterpoint and plainsong at the Royal College of Music. His published output includes biographies of Handel (1883), Mendelssohn (1884) and the opera singer Jenny Lind (1891), all of which are reissued in this series. The present work was first published in 1886. In its narrative of musical history since the Greeks, it gives due weight to the development of music in England and includes, naturally, a chapter on Handel that reflects his enduring influence on national taste. The final section of the book discusses the contemporary musical scene and considers the importance of the recently deceased Wagner for the music of the future.